post-title The publican who played rugby. 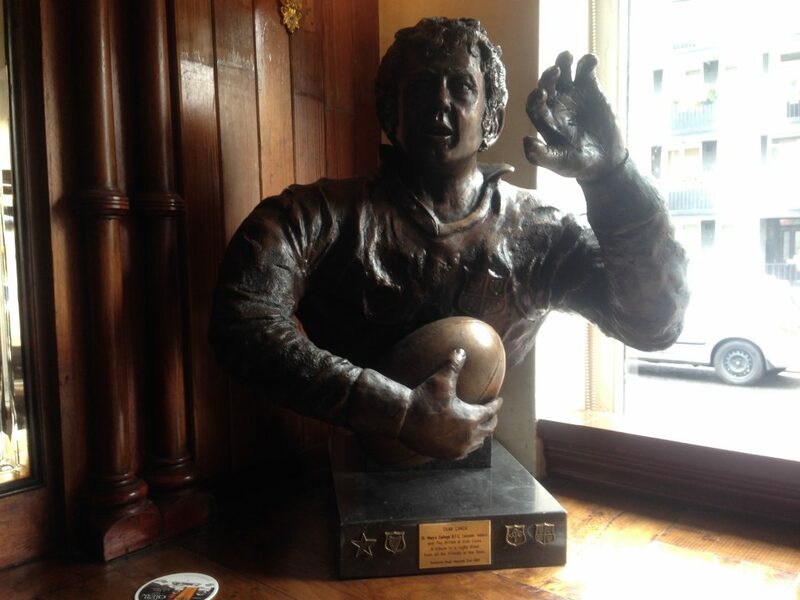 Why The Swan bar is Dublin’s rugby pub. Home / 2016 / The publican who played rugby. 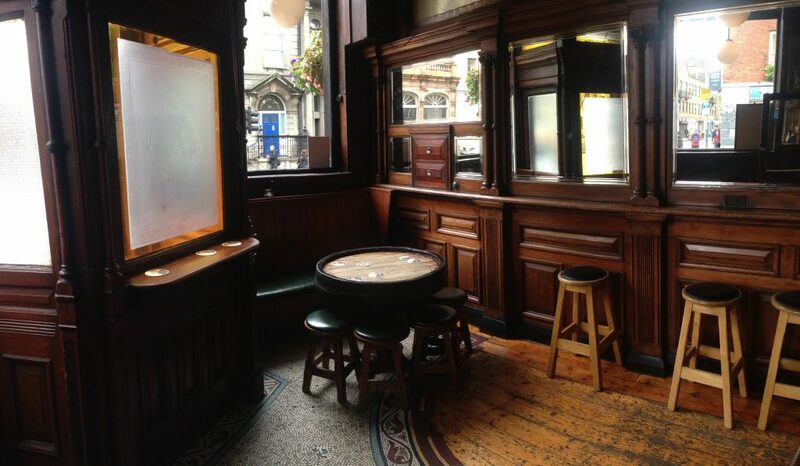 Why The Swan bar is Dublin’s rugby pub. There’s a few bars around Dublin city these days that are owned or part owned by Leinster and Irish rugby players. But, there exists a pub in Dublin where the pub is not only owned by a former rugby player, but was also operated by them during their international career. Today The Swan bar on Aungier street is operated by Ronan Lynch, who is the third generation to have worked and owned the pub. His father, Sean was a well known, and well liked publican around town. He was also the first publican to have played international rugby for Ireland. Sean grew up above the pub on Aungier street, which was owned by his father. Growing up in the area, he went to St. Mary’s in Rathmines and excelled playing for their rugby team. 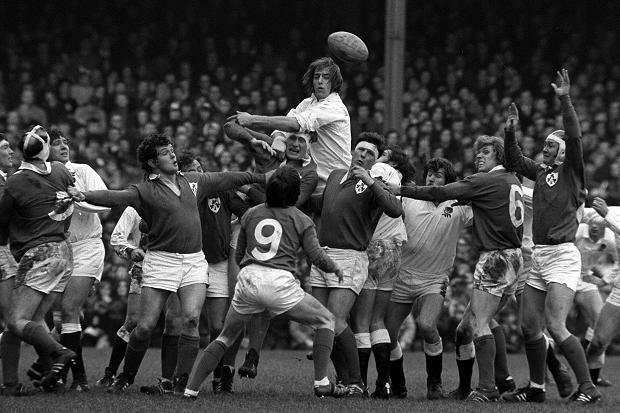 He went on to play tight head prop with Leinster, was then capped by Ireland in 1971, and played for the British and Irish lions later that year. The Lions team that toured New Zealand that year were the only Lions team to have beaten NZ in a test series in 112 years. From theswanbar.com. Sean is the player with his arms outstretched. Playing for the lions in those days proved quite the challenge, as it required him to be on tour for 3 1/2 months away from his family and his business. Luckily, some of his siblings chipped in to keep the business in good stead during his extended absence. Sean was part of a championship winning Irish team in 1973, but was denied the grand slam because Wales and Scotland refused to play in Ireland because of ‘the troubles’. During this distinguished career Sean made many friends and admirers that cemented the reputation of The Swan as a through and through rugby pub. In the days before professional rugby, it was very common for the players to come into the pub after a match for a few jars. Indeed, it had become a tradition for the whole squad to come into the pub on a Friday night before a Saturday game to have 2 or 3 pints as a team building exercise and to settle their nerves. The team usually stayed in the Shelbourne hotel off Stephen’s Green the night before the match, which wasn’t much of a walk from The Swan. Obviously sports science back then isn’t what it is now and nutrition was seemingly largely down to the player. This was of course an amateur sport at the time too, so a few pints was a very accepted means to bond the team together and seen as nothing out of the ordinary. There was one superstition involving the pub and the Irish national team that occurred during the 80s. When some of the team came into the pub for their Friday pre-match pints they would sit in the snug for some privacy. There were usually 3 local older ladies sitting in the snug. The players thought that if the 3 ladies were there the night before a match that it was a good omen and that they would win the match. They won 2 triple crowns during that time, so maybe there was something to it. The are area where the snug once was. Mick Doyle, the Irish coach at the time had played with Sean Lynch, as had the Irish captain Ciaran Fitzgerald. As such, the connection with the pub remained long after Sean had retired. It wasn’t just Irish teams that came into pub either. Scotland, and other international teams would come in for pints after a game on a Sunday. Today the rugby connection is still very much alive. 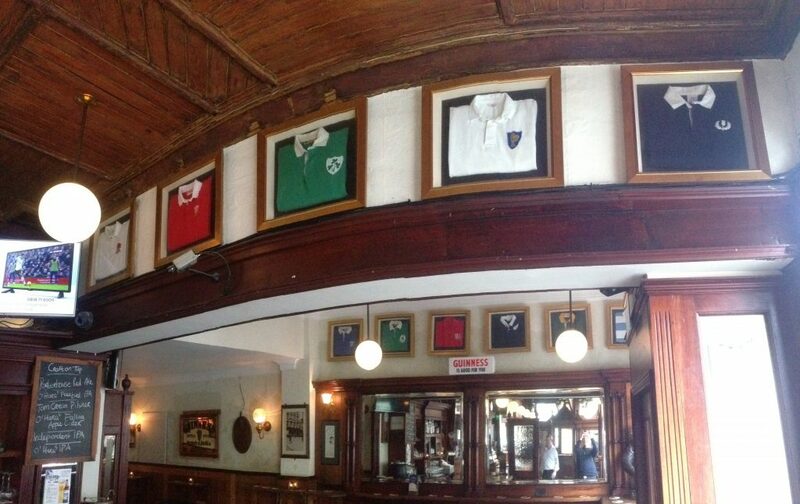 Sean’s accumulated jerseys that he swapped when playing for Ireland and the lions hang on the walls of the pub. The jerseys had lingered in a black bag in the hot press for years until Sean’s son Ronan convinced him to have them framed and displayed in the bar. When he played for Ireland he was given 2 jerseys per season by the IRFU and had to buy the rest himself. Ronan describes his father as a humble man who doesn’t seem to want a fuss made. 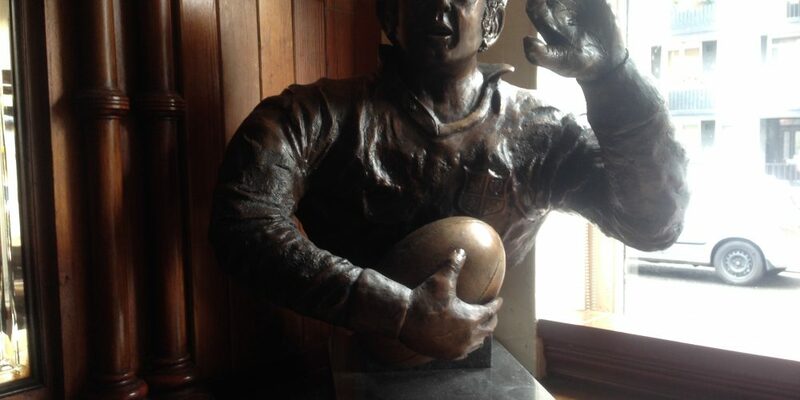 But it’s clear to see that others appreciated his talents both as a player and a publican when they raised funds to have a bust of Sean during his playing days created and displayed in the pub. Today local rugby clubs and rugby fans still come to the pub. Although Ronan does most of the day to day work of operating the pub, Sean can still be found doing a shift behind the bar. 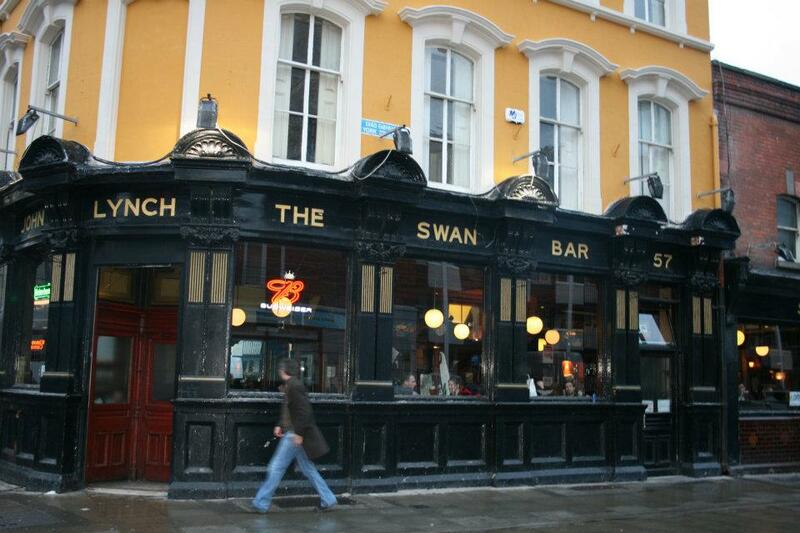 So, when you think of pubs in Dublin with a rugby tradition, The Swan should really be foremost in your mind.